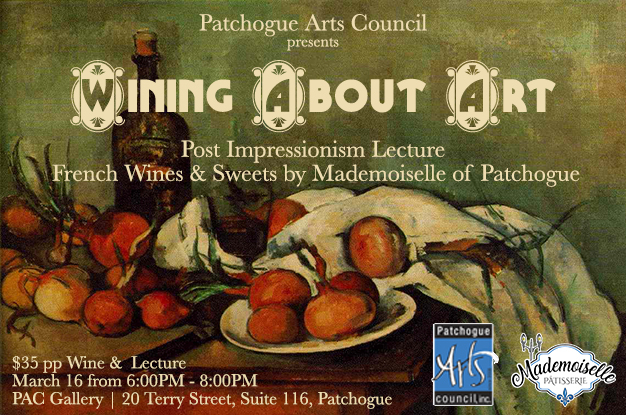 Event: "Wining About Art" - Post Impressionism Lecture with Wine & Sweets | Patchogue Arts Council, Inc.
Beginning in March 2019 PAC will present a new series of art talks in a very special way. Each art historical topic will be paired with wines from the associated region. First up, John Cino will be speaking about Post-Impressionism. Get ready for some French wines as the art transforms from Realism to Abstraction and beyond in a thirty year period. Other fascinating topics will be explored in 2019 by guest speakers. and the beginning of modern art. Post-Impressionists: Van Gogh, Seurat, Cezanne, and Gauguin will be discussed. The talk will conclude with a brief survey of those whose works followed included Picasso, Matisse, and Kandinsky. There is no service charge for checks or cash.